Alibaba-backed Chinese bicycle sharing unicorn Ofo , which is one of China's hottest startups, the bicycle-sharing venture Ofo that is valued at $2 billion, aims to enter the Indian market by the first half of 2018,according to economic times. Ofo spokesperson said in an emailed response that the company’s strategy was in line with the growing interest in bike sharing as part of the smart mobility initiatives in India. “We hope to bring our globally proven technology and operational excellence to help this sector grow.” Social media posts by its senior executives also suggested that Ofo’s first port of call in India will be Chennai. The company has also been laying the foundation and building teams for a full-fledged launch in several other cities, including Coimbatore, Indore, Ahmedabad and Bengaluru. According to Chinese state news agency Xinhua ,Ofo will import bikes into India and proposes to offer its services for free and waive deposits till the year-end.Ofo's app allows users to track where its bicycles are parked as well as unlock and lock the two-wheelers.  Users pay $1 an hour for the bicycles. "Ofo's model would need to be tweaked and localized for the Indian market. Ofo operates in 200 cities across 19 countries, including China, Australia, Singapore, Japan and the UK. It has a fleet of 10 million bikes, powering 32 million rides a day. The company’s entry into India is a significant development given that it is the first foreign player in the segment. In its home market of China, Ofo competes with Mobike for the pole position. Both companies are valued around $1.5 billion, and there has been speculation that the two companies were exploring a merger to bring down cash burn. Mobike is backed by Alibaba rival Tencent. In July, Alibaba Group, along with cab aggregator Didi Chuxing and DST Global, had invested $700 million in Ofo. Meanwhile, Ofo’s entry in India coincides with Zoomcar and Ola launching their operations in different locations. Zoomcar had announced its entry into app-based bicycle sharing in mid-October and had launched its services in select locations in several cities. Meanwhile, as we mentioned in our recent post former Inmobi founders are among the latest entrant in the bike sharing platform called "Yulu, Yulu is starting off with Bangalore as its test market with regular, dockless bicycles that people can rent using their iOS or Android phone. The bikes unlock via QR codes and bill the rider for every 30 minutes of use. However if Ofo is here.. can its Chinese rival Mobike be far behind? With Hyderabad Metro Rail deciding to set up dedicated parking space for bicycles, Mobike dockless bike-sharing app is hoping to set up its first bicycle sharing operations in the city. The China-based start-up is trying to get the first mover advantage by being the first of the three major dockless bike sharing startups trying to enter Indian markets in recent times. In China, dockless bike-sharing has become so popular, that there were more bike-sharing rides in China in the first quarter of 2017 than the total number of on-demand trips in India in that same period. The problem, however, that many of these bike-sharing systems have come across is its bikes stacking up and congesting sidewalks and pedestrian roadways. That’s become a central concern for local regulators in the U.S. as dockless bike-sharing companies just beginning to take off. With the Indian government investing heavily in developing infrastructure including new Rapid mass transits systems and Metro Rails, Bike sharing can help being a part of the " last mile " connectivity problem. After Ola and Zoomcar, one of India’s biggest Unicorn, Inmobi has decided to foray into the online bike sharing platform. Early this year Ola has already started to address the last-mile connectivity by enabling users to share bikes in ensuring reliable mobility in one of the leading industrial centres in North India. Ola offers a range of smart commuting options in Faridabad that include multiple cab options like ‘Sedan’ and ‘Mini’, ‘Auto’, ‘Ola Share’, ‘Ola Outstation’, ‘Ola Rentals’ and now ‘Ola Bike’. The launch of bikes on the Ola app follows the Company’s MoU with the Govt. of Haryana to introduce innovative commute options for citizens across the state. Ola Bike is currently available in Faridabad at Rs. 5 per kilometer with Rs. 20 as base fare for first 3 kms, making them immensely useful for short trips”. 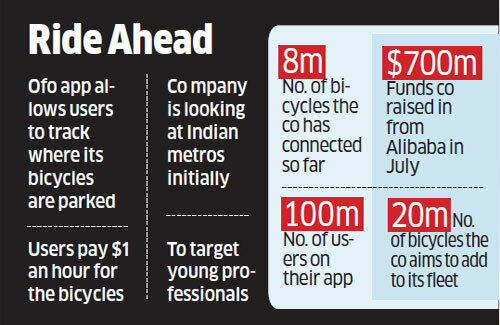 Among the latest entrant in the bike sharing platform would be Yulu, co-founded by Amit Gupta, who formerly co-founded profitable, billion-dollar startup InMobi. In the next three to four weeks, Yulu will launch its bike-sharing service in Bangalore with a few hundred bicycles. 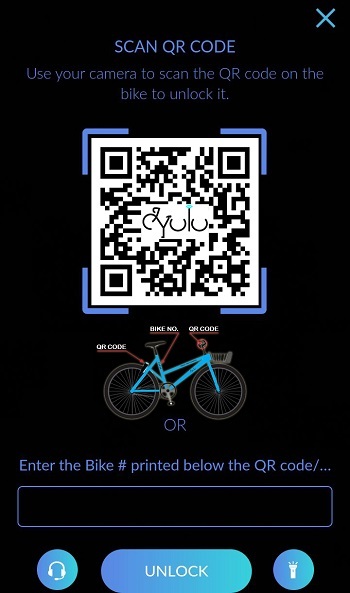 Yulu is starting with regular, dockless bicycles that people can rent using their iOS or Android phone. The bikes unlock via QR codes and bill the rider for every 30 minutes of use. The Indian Bike-sharing has become a hot space for founders and VCs alike in view of rising four wheeler traffic, lack of proper public transport ,congested roads and high vehicular pollution. In China, companies Ofoand Mobike have both achieved unicorn status for their respective bike-sharing startups. In the U.S., investors have poured in $62 million to LimeBike and $8 million into Spin as both startups aim to compete against Motivate, the company behind Ford’s GoBikes in San Francisco and CitiBikes in New York City. Inmobi'' Founders Yulu will have bicycles powered by GPRS, GPS and Bluetooth technology that gives freedom to rent and return bikes from all major places in the city using Yulu app. It already has set up a secure and hasslefree digital wallet to pay.To operate Yulu, users will need to install the Android or iOS app and load their wallets using Paytm, UPI, credit cards or debit cards. The platform will work on a pay-per-use model, where users will be billed for every 30 minutes of use. Apart from this, Yulu will also generate revenue from advertising on bicycles and data from its usage. Registered users will be able to unlock a bicycle by scanning the QR code on bicycles and can start their ride.An advance low energy protocol of Bluetooth and GPS makes it dockless, thereby giving freedom to Yulu users to pick and drop our bicycles anywhere under the sun….Unlike Uber, where a car comes to the users, one just needs to locate the nearest available bicycle and walk towards it. Meanwhile Self-driving car service provider Zoomcar have already launched PEDL, the country’s first technology-enabled cycle sharing facility in three cities in October 2017.The service is available in Bengaluru, Kolkata and Chennai, operating 500 bicycles in the three cities. Zoomcar has plans to have more than 10,000 bicycles by year-end as part of expanding the service. The cycles are currently available in Besant Nagar, Chennai, HSR Layout in Bengaluru and Golf Greens in Kolkata. Zoomcar's bicycles are equipped with smart locks that can be unlocked using a QR code. It also has real-time GPS tracking, solar battery charging and built-in alarms. Each cycle has a multipurpose basket to afford the convenience to customer in travelling for work or leisure. Customers planning to use the cycle need to pay Rs 10 per half an hour via mobile wallet PayTM and need to drop the cycle at any of the PEDL locations. India happens to be the biggest 2 wheeler market in the world currently with over 7.7 million two-wheeler sold in India last year, while China trailed at 16.8 million units "The massive government spending in rural programs and large road-construction projects is leading to a pick-up in volumes in smaller towns and villages. Besides rising incomes and growing infrastructure in rural areas, one big reason for the spurt in sales has been women commuters who like the ease of zipping in and out of chaotic city traffic on their gearless scooters. Honda has the biggest market share in the scooter market in India and according to the company, its share of women owing scooters stands at 35%. However on the flip side Fifty-five lakh two-wheeler's are the biggest contributors to the India's national capital's vehicular pollution, According to environmentalists, bikes and scooters emit nearly 32 per cent of air pollutants generated by the transport sector in Delhi. Diesel-run trucks account for nearly 28 per cent of vehicular pollution in Delhi.